Education is great but it’s really my creativity that’s taught me that I can be much more than what my education told me I am. When I think of the future, I never see myself moving forward in time. I actually see time moving backward towards me. I can’t promise my child a life without bias we’re all biased but I promise to bias my child with multiple perspectives. K.K. 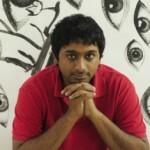 Raghava also known as Raghava KK and Raghava K K, is a contemporary artist living and working in New York India. Raghava KK, named by CNN as one of the 10 most fascinating people the world is yet to know of, is a multi-disciplinary artist, working in genres as disparate as painting, film, installation, multimedia, performance, and his own wedding.